Traditional light bulbs could taken off the shelves of UK shops within three years and replaced with energy-saving alternatives, the government has said. The Department for Environment, Food and Rural Affairs (Defra) has been talking to retailers and manufacturers about replacing "inefficient" goods. 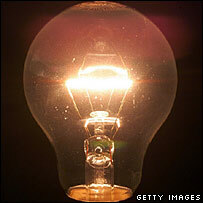 An agreement on minimum standards may even come in before the EU sets laws on such items, a Defra spokeswoman said. Studies suggested modern bulbs lasted longer and cost less overall, she said. Figures from the Energy Saving Trust found energy-saving lighting products had an average lifespan of up to 12 times longer than traditional products, with modern bulbs "saving up to £9 a year on electricity bills", she said. "Work is under way in Europe to investigate the scope for setting minimum standards for 14 energy-using products, including commercial lighting," she told the BBC News website. "We understand that domestic lighting will be covered in the next round of studies, which should commence within three to six months." The European Commission would then "bring forward its proposal for a minimum standard that would prevent the sale of the least energy-efficient products within the EU", she added, saying the process was likely to take three years. "In the UK, we are working with retailers and manufacturers on how we could remove inefficient lighting products from UK shelves in advance of European regulations." Energy policy has been described as "the key sector in combating climate change" by Ian Pearson, minister for climate change and the environment. "The need to improve material and energy efficiency is becoming an increasingly important factor in environmental and economic policies," he said in a written ministerial statement on Wednesday. And this week a report for the British government, compiled by Sir Nicholas Stern, warned that the world must act now on climate change or face devastating economic consequences.